What incredible risks Anthony Bosco took for the new Chapel Street Players production of Rabbit Hole by David Lindsay-Abaire! First of all, the cast were almost all new to CSP. Secondly, he was taking on a play which the playwright himself had just adapted for a movie with Nicole Kidman. And thirdly, he is the father of two small children taking on a play about how a couple deals with the death of their child. But on opening night on February 25, his willingness to take risks paid off. Kate Brennan as Becca and Jessica Rowland-Eppler as her sister Izzie had the audience so involved one lady couldn’t resist mumbling in response to their rants. And when it became clear that the clothing that Becca was folding so carefully had belonged to her four-year-old son who had died months earlier– it was hard to decide whether to laugh or cry. Howie, Becca’s husband, played by Jason Fawcett, seems to be cool, collected and ready to kiss his wife back to normal. But even he has a limit to his patience. It is easy to empathize with him until Izzie raises suspicions about just how he might be coping. Performances by Marlene Hummel, who plays Becca’s unrestrained mother, and Neil Redfield, who plays the hapless youth Jason, are catalytic. They force Howie and Becca to break their controlled postures and vent their grief. 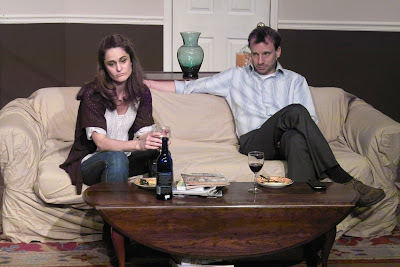 The play presents each character against contrasting personalities. Becca’s neurotic quelling of her grief is highlighted by her exchanges with her carefree and shockingly direct sister Izzie -- Howie’s calm control is upset gradually by his warm but outspoken mother-in-law and all four of them react intensely to Jason’s apologetic entry into their lives. In spite of all the grief and ranting, the play ends with a note of hope. The actors were so good that it is hard to resist the urge to call and see how they are doing. Performances are 8:00 p.m. on February 25, 26, March 4, 5, 11, 12. Matinee 2:00 p.m. March 6 and 12.